The goal for many dental patients with crooked teeth is to find a convenient option that lets them smile with confidence. Whether you value treatment time, affordability, or comfort, advancements in orthodontics create an array of options to help you achieve results with ease. At Dental Ambitions, Dr. Jae Byun provides Invisalign® clear aligners and a host of options for braces on the Upper East Side for teens and adults. Straight teeth benefit your oral health by eliminating opportunities for decay and fracturing to occur. Call our office today to set up a consultation. Children as young as eight can benefit from an orthodontic evaluation, as we can recommend procedures to take of their needs early. One example is palatal expansion, which uses an appliance to help gently expand the roof of the mouth and upper jaw to allow more spacing for teeth to line up properly. The majority of our patients at Dental Ambitions seeking an evaluation for straighter teeth are teenagers, but more adults are seeking this cosmetic improvement. At your consultation, we answer your questions and concerns, determine the extent of treatment, and help you choose your most beneficial straightening option. 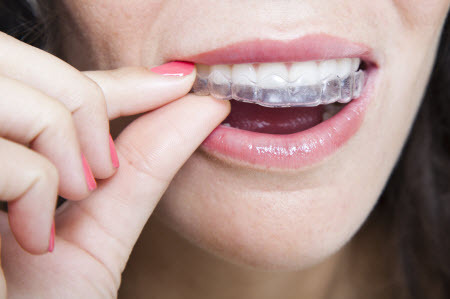 More complicated cases may benefit from traditional braces, though improvements in Invisalign® clear aligners allow them to treat most orthodontic complications. Dr. Byun is a certified Invisalign Preferred Provider, so many of our patients seek this opportunity. He sends your x-rays and impressions to their professional lab to create your custom aligner trays. We schedule monthly appointments thereafter, where we attend to any maintenance and send you home with trays for the next month. In addition to standard Invisalign, we also offer alternatives. Invisalign Teen® features a system of indicators that allow parents to monitor their teenagers’ progress. For those with minor alignment issues, Invisalign Express® reduces the number of trays used for treatment, meaning faster and less costly results. Ready to Achieve a Straighter Smile? Call Us Today! Our New York City patients understand the value of saving time. At Dental Ambitions, we provide orthodontic treatment options on the Upper East Side that straighten your teeth efficiently. For more information, contact us today!